The two-line TV onscreen description summarized the film something like this: a twenty-nine year-old woman gets dumped three weeks before her wedding and then struggles to find love and happiness. I didn’t watch the film because of the blurb. I watched because of the title. Now that I’ve watched, I’m depressed. Lola Versus happens to be the first two words from the title of one of my favorite all-time albums, Lola Versus Powerman and the Money-go-round, Part One, from my all-time favorite band, The Kinks. I would call it an iconic album, but the fact that so few people seem aware of its importance (existence?) kind of argues against the useful definition of the term. My love for The Kinks is such that even the merest suggestion of something connected to them brings me running. My loyalty to The Kinks means I sometimes end up enduring things I wouldn’t otherwise endure. Remember the movie Club Paradise? Of course you don’t; no one does. 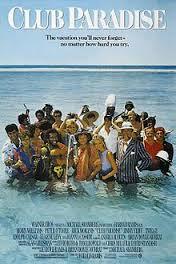 It came out in 1986, and starred Robin Williams, Rick Moranis, Eugene Levy, Jimmy Cliff, and, if you can believe it, Peter O’Toole. In the commercials for the film, they used the Kinks’ song “Apeman,” also from the album Lola Versus Powerman etc., etc. That was enough for me. Elizabeth and I went to see it the summer we started dating. Club Paradise put me in a difficult spot. For years afterward I defended the film, insisting that it was “okay,” or “so-so.” But it wasn’t. It was dreadful. Only I couldn’t bring myself to admit it, because they had been kind enough to feature “Apeman” prominently in the film. With my twisted sense of fealty, I felt like I owed Club Paradise something because they had publicly acknowledged the greatness of my favorite band. Sometimes, though, loyalty – even misplaced loyalty – can pay off. 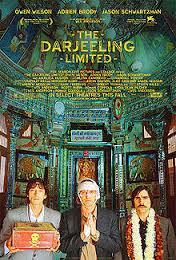 I never would have seen The Darjeeling Limited if it hadn’t been for the fact that I heard the Kinks’ song “This Time Tomorrow” coming from the video screens inside a Blockbuster several years back. I went home with the movie, a dry, low-key Wes Anderson comedy starring Owen Wilson, Adrien Brody and Jason Schwartzman, and was surprised by how much I enjoyed it. That it featured not one but three Kinks songs certainly didn’t hurt my affection for the film; however, I can say with a clear conscience I would’ve liked it anyway, even without the songs. (Incidentally, the other songs featured in the film are “Strangers” and “Powerman.” All three come from the same album, which is, you guessed it, Lola Versus Powerman and the Money-go-round, Part One. 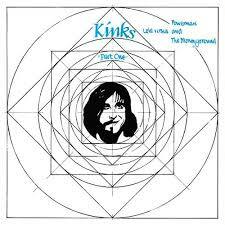 And before you ask, yes, The Kinks recorded more than one album, although, never one called Lola Versus Powerman and the Money-go-round, Part Two. The world is still awaiting that one). Hopefully by now it is starting to become clear why a movie released under the title Lola Versus would grab my attention. I watched the film closely, and when it was over, I scrolled through the soundtrack credits in super slow-motion just to be sure I hadn’t missed something. Twice. But not a single song was used. Not even a lyric, or a fleeting instrumental fragment, nothing. No Kinks song playing incidentally in the background, coming from a radio, or even an elevator. And unless they were incredibly subtle about it (and trust me, subtlety was not this film’s strength), I wasn’t able to detect even a single reference, overt or inferred, to the album Lola Versus Powerman and the Money-go-round, Part One, any of its songs, or the band who made it. That’s what left me feeling blue. And yet you can’t truly understand the full depth of my depression, because you are lacking one crucial piece of knowledge. Kinks fans, perhaps more than any other band’s fans, live with two omnipresent fears. One is that The Kinks, their source of such great personal joy and inspiration, is on the verge of being hopelessly forgotten by the larger public. The second is that ‘verge’ is overly optimistic. That fear has probably been there from the beginning for Kinks fans. I wasn’t born until 1968, and so I completely missed their initial rise to stardom as part of the British Invasion. But it seems The Kinks have always lived in the shadow of the other great bands of the time, bands like The Rolling Stones and The Who, not to mention that little Liverpoolian ensemble, whose name escapes me at the moment. All of whom might arguably be better bands – I say arguably, and I mean it – but each of whom did a much better job creating a niche for themselves that appealed to massive numbers of people; in other words, were far more successful at being successful, at least commercially. The Kinks were always there in the mix somewhere, but often closer to the margins than the middle. That’s just how things seemed to go for this band. What I remember, starting in the mid-70’s or so, was that every now and then they’d have a song hit the charts, and then they’d fade from popularity, only to resurface again a year, or two years, or five years later with another one. I’d be willing to bet that in the history of rock’n’roll, nobody has had more breakthrough songs than The Kinks. Nobody’s had to. With each new hit, the hopes of Kinks fans would rise. Maybe now they’ll start getting the credit they deserve. Maybe this will make people go back and discover the brilliance of Village Green Preservation Society or Face to Face, we’d say to ourselves. We’d have to say these things to ourselves, as there wasn’t another Kinks’ fan within shouting distance. Inevitably, though, there would be no Kinks revival sweeping over the landscape of popular culture. No belated beatification. Just another hit song blithely consumed by a voracious crowd, which would then turn its blithely insatiable appetite to the next new thing. And each time, the longsuffering Kinks fans would be left to ask themselves if this was it, if this last song was the band’s last chance to reverse their incredibly prolonged slide into oblivion. How could they give a film the title Lola Versus, and not reference the album in any perceivable way? This is a mainstream Hollywood movie, released by a big Hollywood studio (Fox Searchlight, which ironically also produced the aforementioned Darjeeling Limited). Are you telling me that no one there was aware that they were cribbing the title from one of the truly great albums in rock music history? Or did they think that no one would notice? That’s the cruelest cut of all. That they might have known, but figured that the theft was so slight that it didn’t even need to be addressed. That nobody would even notice, or know better. It’s the very thing that cuts to the core of every Kinks fan’s greatest fear and insecurity, but it also implies something even larger. What does it mean that something as wonderful as this band could have been created, and existed for so long, and been famous and successful on a scale 99.9% of bands could only dream of, only to be finally and utterly forgotten by the world at large? It’s an existential nightmare scenario. What makes me so depressed is knowing how much they deserve to be remembered, and how increasingly unlikely it seems that they will be. So, thanks, Lola Versus, for the rude reminder. And by way of returning the favor, thanks also for wasting eighty-seven minutes of my life watching you, with your cast of feckless characters who are convinced that they’re more clever than everyone else, and that they are suffering more than everyone else, and who spend the entire movie moping around spouting supposed witticisms on life and love that they so smugly present as profound insights, but are really just empty, cynical … oh, I don’t know, what’s the opposite of insights? My only consolation is that whatever The Kinks' ultimate fate in the public memory may be, it will be infinitely better than yours.